A stunning complement to your unique collection, this intricate piece is crafted by artisans in India. It's hard to believe that this intricate, mosaic-style design started as a humble piece of reclaimed wood. Artisans in India collect the rich, varied pieces and transform them. First, they carve a mandala-inspired edge along the bottom. 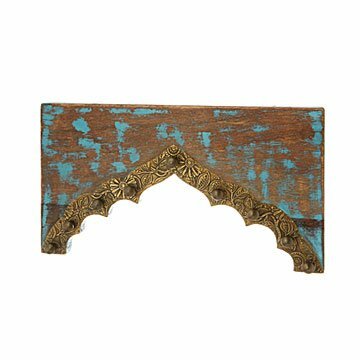 Then they apply unique brass details and bright touches of turquoise paint. When it's complete, the design makes a stunning resting place for your necklaces and bracelets with nine brass pegs. It also makes a decorative housewarming gift for the jewelry lover. Handmade in India.